Violins and shelter pets - Petfinder Members. Did you know that today, December 13th is National Violin Day? While the purpose of this day is to encourage people to listen or play violin music, it got me thinking about the important role music can play in our everyday lives. There is often great passion and delicacy behind violin-based music that many find soothing and studies indicate this is also true for many shelter pets. There are some really interesting programs out there that study the effects that soothing music has on pets in a shelter environment. 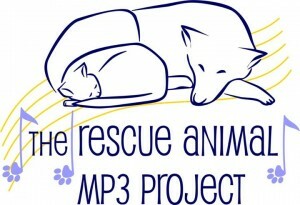 The Rescue Animal MP3 Project is one. Image from The Rescue Animal MP3 Project’s Facebook page. A very interesting idea! Personally, music plays a very important role in my life and certainly helps both me and my dog relax and enjoy ourselves. Have you ever tried playing calming music or soothing sounds for your shelter or foster pets? Was it helpful? What sort of results did you see?